1) POSTCARD : FRONT - EcoSeal® logo and tagline info over wet asphalt. Promo text emphasizes the company's eco-friendly mission statement. Image of commercial parking lot reinforces EcoSeal® professional sealer results. List of Commercial Pavement services and call-to-action prompt customers to call for a free estimate or visit the website for more info on toxic (CTS). 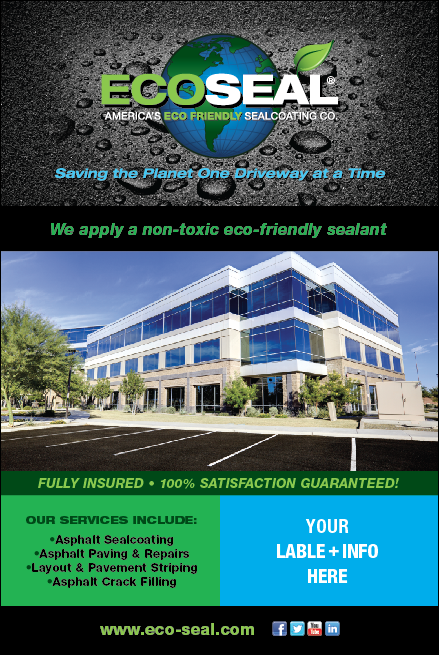 2) POSTCARD : BACK - EcoSeal® logo and tagline info over wet asphalt. Text emphasizes Complete Pavement Maintenance. Call-to-action text prompts customers to call for a free on-site estimate, send an email or visit the website for more info. Includes standard Postal Code compliance on right side.